At the end of Barry Harvey’s Taking Hold of the Real, Harvey contrasts the Confessing Church in Nazi Germany to Andre Trocme’s church at Le Chambon-sur-Lignon, which offered shelter to thousands of Jews fleeing Nazi persecution. In doing so, Harvey illustrates one of Bonhoeffer’s most cherished beliefs: that God and the church live at the center of the village, not on the margins of society in “weakness, death, and guilt.” Neither does God live solely in a sanctified sanctuary space, and certainly not wholly in the afterlife. The difference between Le Chambon and Nazi Germany, Harvey asserts, was that in Le Chambon a group of people had been formed over time to respond compassionately to the persecuted. In contrast, the Confessing Church did not make an adequate response to the suffering, despite Bonhoeffer’s fervent desire to do exactly the kind of formation that led to Le Chambon. Harvey follows main strands of Bonhoeffer’s theology, placing them in a context dear to Bonhoeffer of reframing how the church must understand its relationship to society if it is to fulfill its mission. The book is so rich it will be impossible to recreate all of its arguments here, but I will touch on some of the highlights. One of the book’s focuses is Bonhoeffer’s idea of a post-Christendom “world come of age,” reading that phrase as an ironic commentary on an adolescent world’s belief in the “sophistication” of its own technological and ideological achievements, “achievements” Bonhoeffer understood as destructive illusions. 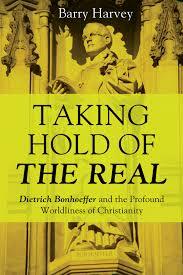 But these illusions, as Bonhoeffer understood, have power—in 1933’s Creation and Fall, he writes that “Humankind is a prisoner, a slave of the world, and its dominion is an illusion. Technology is the power with which the earth seizes hold of humankind and masters it.” Bonhoeffer also notes that separating ourselves from social entanglements does not liberate us, but rather makes us more dependent on the technological regime. I strongly recommend this book. The problems of church that Bonhoeffer faced are strikingly similar to those we face, and our thinking has not yet caught up. Bethge, for instance, made a poignant comment about how heartbreaking it was that after the war, the Protestant church in Germany wanted to go back to January 29 1933. Rather than reflect on what went wrong and how the church needed the change, the people in power wanted to pretend, implied Bethge, that the 12 years of National Socialism never occurred. The church also will continue to flounder and fail to the extent it tries—as it has kept trying in recent decades—to reinvent itself in a way amenable to the worldly power, from “CEO models” to “prosperity” models that replicate the world’s false notion of shalom—until it can, as Bonhoeffer argues, ground itself in a reality apart from structure’s of earthly dominion, in Christ’s reality. Perhaps the hardest part about that is the real thought it requires, when thought, time and contemplation are all at odds with an anti-intellectual, high speed, action oriented society—but this is the thought that Harvey’s book richly engages and that we desperately need to pursue. Diane Reynolds’ The Doubled Life of Dietrich Bonhoeffer is available through Amazon and Wipf and Stock.